Simply Enough Press, 9780692393499, 290pp. In the spring of 2010, Tabita Green's daughter, Rebecka-then in seventh grade-started to feel depressed and lost a lot of weight. Almost immediately, Rebecka's well-meaning health care providers recommended that she take an antidepressant (Zoloft) to "kick-start" the treatment process. What followed was a year-long nightmare of the most unimaginable sort as Tabita and her husband, Todd, watched their funny, bright daughter transform into a psychiatric patient. Rebecka was hospitalized numerous times for suicidal ideations and psychosis-unable to function in the real world. Her psychiatrists treated new symptoms with additional psychiatric medications, but instead of improving, Rebecka's health deteriorated rapidly. As the year progressed, the Greens started to question the wisdom of the dominant mental health care system, which puts pills front and center, and eventually worked up the courage to ask the psychiatrist to take Rebecka off all medications. Within weeks, Rebecka's suicidal and psychotic symptoms disappeared completely. Now the family was able to focus on the real problem, her disordered eating. Rebecka was on the road to recovery. In "Her Lost Year," Tabita (with Rebecka) shares this intimate story of despair, recovery, and hope, but she doesn't stop there. She goes on to describe what she learned about psychiatry in the US-especially related to kids and teens-and discusses the ever-widening definition of mental illness and the culture of medication as a first, rather than last, resort. Subsequent chapters cover a wide range of effective, alternative treatment options from taking care of physical needs to specific therapies including family therapy and dialectical behavior therapy (DBT), therapies that helped Rebecka and her family heal. In the last third of the book, the author ponders why so many people are struggling mentally and emotionally in the first place. What if we could redesign our society for optimal mental health? What would such a society look like? And what actions can we take now? 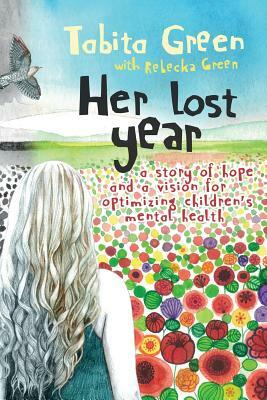 "Her Lost Year" is a must-read for every parent, caregiver, teacher, mental health professional, politician, and community member who cares about children's mental health. Beyond inspiring hope and providing valuable insight into children's mental health care, it offers concrete steps for how we can transform our homes, our schools, and our society into environments that are conducive to mental health. It is a reminder that many struggling kids are not "disordered"; they're simply trying to communicate that things are amiss-and they are right. It's time we did something about it. "This is a book every parent should read. While the book title is 'Her Lost Year,' it also tells a story of triumph and hope for adolescents and their parents." "Green's untiring advocacy on behalf of her daughter and her vision of what life can become is truly inspiring and an effective antidote to the cynicism of our age." "As a social work educator and a mental health clinician, I continue to believe that we need to listen to our clients and learn from them. Read the book."